-Ball-handling skills are a work in progress. Averaged nearly 5 turnovers per-40 in Zaragoza. -Capable 3-point shooter but not consistent yet. Career 32% for 3 in DX database (37 games). Outlook Had a tremendous tournament averaging 33 points, 8.5 rebounds and 4.7 assists per-40, confirming himself as one of the top talents in the 1999 age group, certainly amongst Europeans. Elegant player with plenty of virtues and flaws that can be corrected in time. Still figuring out how to use his talent consistently on both ends of the floor. Will be interesting to see how his mentality evolves in time. Moving to a high school in North Carolina next season and may be on the college track long term. Hoard was one of the most productive prospects in Zaragoza, often overwhelming teams with his combination of excellent size and polished skill-level. At 6'8 with long arms and a solid frame, Hoard was most effective using his size and improving ball handling skills to get to the rim on straight line drives and dominate games in transition. Hoard showed flashes of his athletic ability, and although he is not the most explosive leaper he is fluid in the open floor and quick off the ground, showing particularly good instincts on the offensive glass. He is an improving outside shooter with solid mechanics and balance who showed the ability to knock down contested outside shots, but could benefit from a quicker release. His pull up game off the dribble could be improved, as he often settled when he could have attacked where he was at his best. He has the ability to really influence the game on the defensive end with his length, and he showed that with his ability to get in passing lanes. Hoard spent the past two seasons at famed INSEP Academy in France, but is transferring to Wesleyan Christian Academy in North Carolina for his junior season. 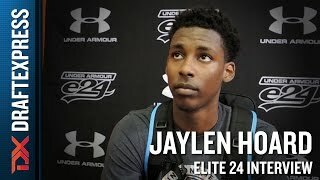 Hoard, who was the MVP of the 2015 Jordan Brand Classic International game, will get a new challenge for his upcoming Junior season as he moves to the United States and will surely be on the radar of high-level Division I programs.